The easy-to-use meter probe can be used to quickly determine if the pH of your soil meets the needs of the various types of plants or lawn grasses in your landscape, lawn or garden. More details below! 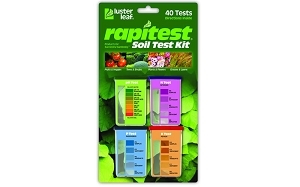 Use the Luster Leaf Rapitest Mini pH Tester 1815 for testing soil pH. The easy-to-use meter probe can be used to quickly determine if the pH of your soil meets the needs of the various types of plants or lawn grasses in your landscape, lawn or garden. No batteries are required for operation. 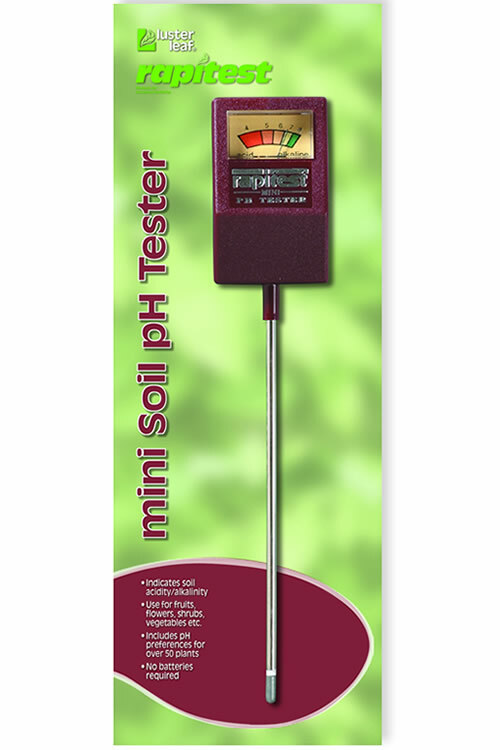 If the plants in your landscape, lawn or gardens just don;t seem to look or grow well it could as simple as a soil pH problem. In order to grow and be healthy, plants need food nutrients such as nitrogen, phosphorus and potassium, the three numbers you'll see on any bag of fertilizer. These nutrients play a vital role in plant growth just as vitamins, minerals, carbohydrates and proteins do for our own health. If the soil pH is outside the range of what a specific plant prefers the roots of the plant cannot readily absorb these vital nutrients. In vegetable gardens, soil should be tested between crops, before planting in spring and when preparing beds in fall. Soil in lawns and around ornamental shrubs and trees should be tested at least one time every two years. Soil in perennial gardens, annual flower beds and container gardens should be tested at least one time a year. For reliable soil pH readings, be sure to polish the probe shaft (not the tip) and acclimate the probe in the soil before recording a soil pH reading. Remove the top 2” of the surface soil. Break up and crumble the soil underneath to a depth of 5”. Remove any stones or organic debris such as leaves and twigs because they can affect the final result. Thoroughly wet the soil with distilled water to a mud consistency. Also see further advice, below. Using the specially supplied pad, lightly shine the probe, carefully avoiding the bullet shaped tip, to remove any oxides that may have formed on the surface of the metal. Wipe the probe clean, always wiping away from the tip and towards the meter body. Press the power button to turn the meter on. Push the probe vertically into the moistened soil. If it does not slip into the ground fairly easily select a new position. Never force the probe. Twist the probe clockwise and counter-clockwise between your fingers several times to ensure that damp soil is well distributed over the surface of the probe. Wait for 60 seconds to acclimatize the probe and take the reading. Remove the probe from the soil and wipe any soil particles from the surface of the probe. Re-shine the probe and insert back into the soil at a different point, avoiding the first hole made by the probe. Twist the probe two or three times between the fingers, as before, and wait 30 seconds before taking the final reading. Remove the probe from the soil and wipe any soil particles from the surface of the probe. Do not re-shine the probe. Insert the probe back into the soil at a different point avoiding the first hole made by the probe. Twist the probe two or three times between your fingers, as before, and wait 60 seconds before taking the final reading. 1. Take the sample of soil to be tested from the ground and remove stones and organic debris. 2. Prepare the sample by crumbling the soil into small particles. 3. Measure 2 cups of soil from the prepared sample. 4. Fill a clean glass or plastic container with 2 cups distilled water and add the measured soil sample. 5. Ensure the soil and water are thoroughly mixed and compact the sample firmly. Drain off any excess water. 6. Take your tests as detailed under the heading above titled "Taking a pH Reading"
• Stones or other organic matter touching the electrode. • Sample area not sufficiently compacted. • Metal particles adhering to probe after cleaning. • Soil not adhered to the probe sufficiently. • Probe too close to the side and/or the bottom of the pot. • Sample area is too dry. • Damaged or pitted probe. Raising and lowering pH is not an exact science and most plants have a reasonably wide pH tolerance, certainly to within 1 pH point. While a majority of plants can survive on a pH around 6.5, some need a particularly acid or alkaline soil. 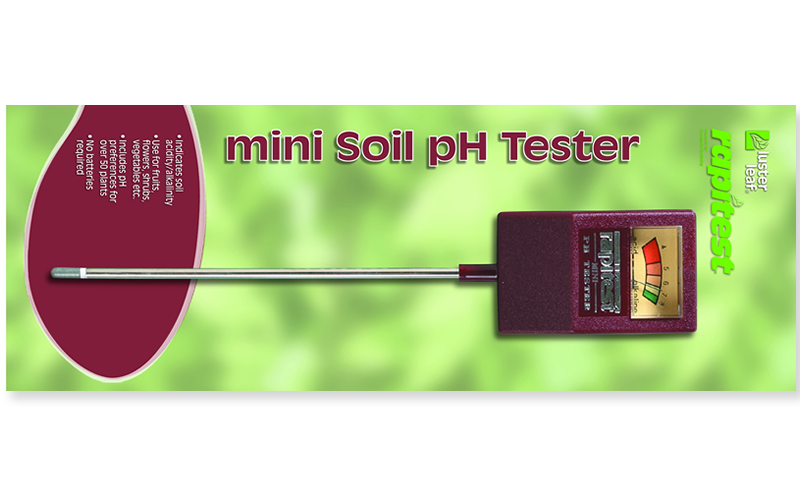 Altering pH takes time, especially when working to lower pH (make soil more acid). Do not expect rapid changes. Work steadily towards giving a plant its ideal conditions. Q: Can the tester be used multiple times ? Yes the tester probe is battery operated and can be used as many times as You like.